Why Use Elm Creek Roofing & General Construction? A good roof boils down to this: the materials used and the skill of the crew doing the work. Yes, we will work with your insurance company to reach an agreement on the damage coverage so you don’t have to. But if the crew doing the installation is sloppy or is supplied with cheap materials, what difference does it make? At Elm Creek, we don’t install poor quality materials, period. We exclusively use highly experienced installers who only install roofing. They are professionals! Elm Creek installs all types of residential roofing. We also offer commercial roofing, including installations and repair to TPO, EPDM, Built Up, PVC, and Modified Bituminous roofing. We are a debt free company. We ask for payment only after your storm damage is repaired. We remove all of the existing roof all the way to the decking. Most “roofers” will leave the old felt paper still on the roof. We inspect and repair the existing decking, if needed. We use only the highest quality materials including lead pipe flashings instead of plastic and no “builders grade” shingles. We do a FULL inspection. We are not just “roof” focused. More gets damaged in a storm than your roof. We install shingles correctly so your warranty will not be voided. We never hand-nail shingles. A calibrated nail gun will give the same perfect results, all day long. 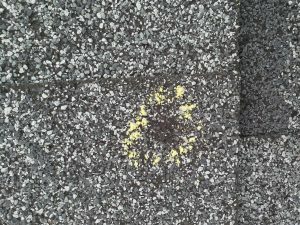 Recognizing damage to your roof is often times difficult, especially from the ground. This is a typical roof as viewed from the ground… everything looks great, right? But upon closer inspection, hail damage is found. Hail removes the granules and exposes the shingle’s sub layer. This spot will quickly deteriorate and eventually leak.